The weatherman said we were going to have a veritable heat wave on Friday, so Maria F. put the word out for riders on Dean's Benson Mule Pull 100K. Since I only live about 2 miles from Swift Creek Coffee I just rode over to the start. There were 5 of us riding: Dean, Maria, Alan, Steven, and myself. Temperatures were still a bit brisk at the start, so we were all bundled up against the cold, but looking forward to a thaw. After leaving Garner on Aversboro Rd. and a short stint on Hwy 50 we made the right on Rand Rd. and I took off to use the hill there for some warm-up. Steven followed me, assuming that we were approaching a county line sprint! At the top we had a gap back to the rest of the group, and Steven asked me if I knew the route well. I said something like "Oh yeah- this is pretty much my standard training route!" so he trusted me not to get him lost. In hindsight I think he decided that was a mistake. We made the turn onto Crowder Rd, and as we approached Ten Ten we had the light so we sprinted to make it. Dean, Maria, and Alan got caught by the light and Steven and I decided to soft-pedal for awhile. We were having a conversation and I wasn't paying attention, so we missed the turn onto Harvey Johnson Rd. Eventually we noticed that they weren't catching up, and figured out that we'd missed the turn. A quick u-turn and we were playing catch up. Steven can really crank out the speed, so it wasn't too long until he'd dropped me. I caught back on Barber Bridge Rd. only to be dropped again on the hill. When we crossed Hwy 42 we had the group in sight. A quick stop at the Grocery Boy Jr. and we were back on the road. Steven and Maria took the lead, but I tarried a bit at the store fixing my cue sheets. Catch-up once again. A little way down the road I was with Dean and watching Steven and Maria pedal past the turn onto Massengill Pond Rd. They heard me ringing my bell and turned around to join us. 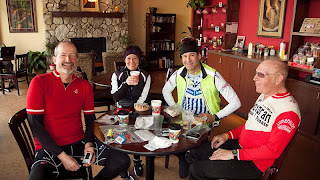 The four of us stuck together the rest of the way into Benson, and Alan caught up to us at the controle there. We all sat down for a cup of coffee before getting back on our way. The sun was out now and the temperature had warmed up nicely as we left Benson. On the way up Hwy 50 I stayed on Steven's wheel and we opened a gap on the rest of the group, but I had once again forgotten to flip my cue sheet so I slowed down while adjusting it. Next thing I knew I was at the turn for Benson Hardee Rd, but Steven was still cranking down Hwy 50! I yelled for him, but wasn't sure if he heard me or not. We figured he'd turn around and catch us again, so we all kept rolling. After awhile I found myself riding solo, but I could always see Maria just behind me. We rolled into The Grocery Boy followed shortly by Dean and Alan. By this point we were worried about Steven, since he really should have caught us before the controle. We enjoyed a nice long stop and lingered a bit more than we usually would, but eventually decided to get back on the road. Just as we left we spotted Steven coming down Carlie Adams Rd. He caught us pretty quickly, having made a really short stop at the controle. We all made the fun descent down Barber Bridge Rd. then I took the lead on Rock Service Station. After turning on Pagan Rd. I shot a quick video. Back on Sauls Rd. Steven and I once again sprinted for the light and made it, I guess the others got caught again. This time we knew where we were going, down Rand Rd, a quick jaunt on Hwy 50 and then Buffalo and Aversboro. As we were approaching the light at Timber it turned green, and I got up and sprinted for it with Steven right on my wheel. I screwed up, wasn't paying enough attention at that speed, and nailed a pothole. I never saw it coming! Took stock of my bike real quick and everything seemed to be in working order. Steven seemed to be right there on the wheel still, so I kept cranking for the light. As we made it through I was pretty sure that Steven had missed the pothole. I was wrong. When we got to the coffee shop at the end he showed me his broken handlebar! Sorry Steven. Nice write up and great riding with/behind you! Watch out for those potholes...you don't want to have to find yet ANOTHER bike. Although it looks like Steven got all the bad pothole juju this time. 1. Where was Alan for the first video? 2. At least Steven didn't crumple his frame! 3. And how did I not see this post earlier?